My favorite shot from the whole wedding. Gorgeous! A friend of mine asked me what my favorite part of Harry & Meghan’s wedding was. My favorite part was everything! I loved that they had it at St. George’s Chapel at Windsor Castle, I loved Meghan’s dress by Clare Waight Keller for Givenchy (and it may not have been intended, but it seems like a nice tribute to Hubert de Givenchy himself since he just passed away in March), and I loved all the jewelry! I loved the neckline and silhouette of her dress by Clare Waight Keller for Givenchy. 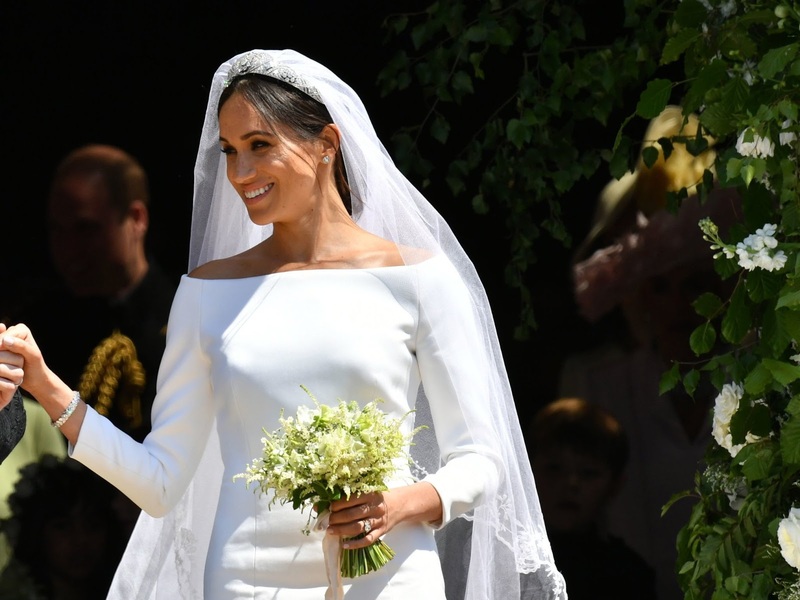 I have never seen the tiara Meghan wore before, and I generally don’t like tiaras, but this one was stunning! I was crazy for the geometric patterns and it sparkled like pure glitter in the sun. It was created for Queen Mary (Queen Elizabeth II’s grandmother) in 1932 and the center brooch is detachable and was given to her in 1893 for her own wedding. If you would like to learn more and see some amazing close-up shots of it, head over to The Court Jeweller. You won’t be disappointed! A great shot featuring the tiara, earrings, engagement ring, and wedding band! A closer shot. Perfect manicure and I love seeing the delicate gold wedding band too. 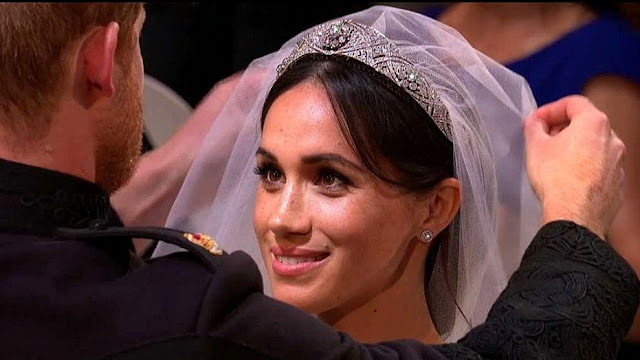 I thought the tiara went so well with Meghan’s Galanterie de Cartier earrings which I wrote about last month. Now I am assuming the earrings were selected because they “spoke” to the tiara’s design. 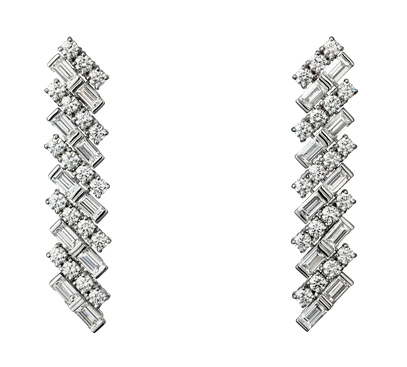 These earrings are so very gorgeous in person, I got to visit with them a few weeks ago at the Cartier Mansion and I told the SA that they feel like modern Art Deco to me. After seeing them with the tiara I feel like this even more. You can see the bracelet in this photo. I also love the small bouquet. 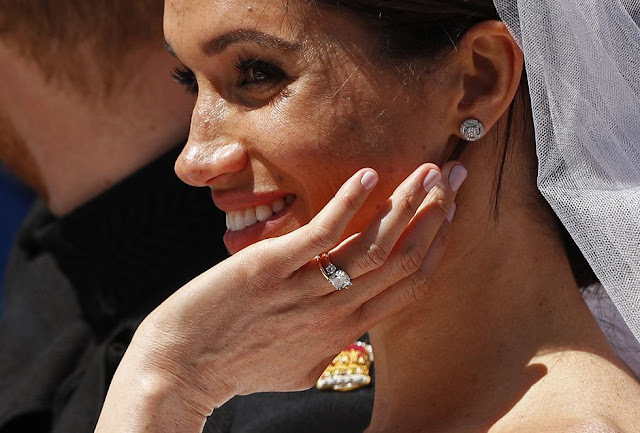 The diamond bracelet she wore immediately caught my attention and I knew I had seen it somewhere before…Because of the research I did on the Cartier website learning about Meghan’s earrings (plus the Cartier Trinity Ruban earrings that Princess Charlene wore recently) I thought it might be Cartier so I headed back to their website and there it was: Reflection de Cartier. 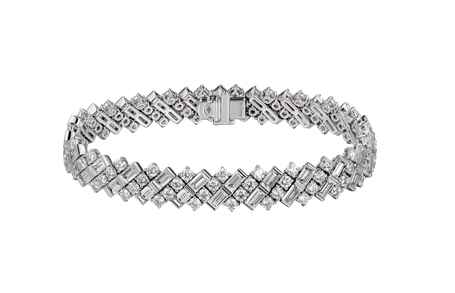 The bracelet is made of 18k white gold set with 104 brilliant-cut diamonds totaling 4.50 carats and with 52 baguette-cut diamonds totaling 5.61 carats. My mother tells me that Prince Charles gave Kate Middleton a diamond bracelet for a present when she married William so she thinks that Prince Charles probably did the same for Meghan. Reflection de Cartier bracelet. Stunning! 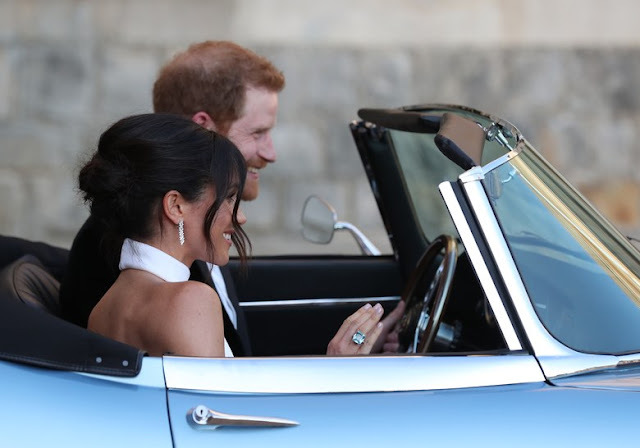 And maybe Prince Charles also gave her the fabulous earrings she wore to the evening reception, because they too are from Cartier, the same Reflection de Cartier collection. You can just make them out in the side shot of Meghan & Harry leaving for Frogmore, down below. They are made of 18k white gold, each set with 19 brilliant-cut diamonds totaling 0.81 carats and 10 baguette-cut diamonds totaling 1.08 carats. A great look for both of them, heading to the evening reception. Reflection de Cartier earrings. Love them! Cartier earrings and a ring from Princess Diana’s collection. 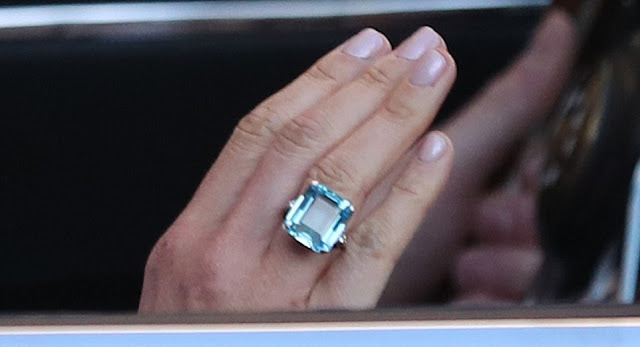 I read that the aquamarine ring Meghan wore was a gift to her from Harry and was a piece that belonged to Princess Diana. It was made by Asprey. I loved this close up shot of it I found over at the Daily Mail. A closer shot of the ring. Wow! It was a beautiful day and a beautiful wedding. I enjoyed it thoroughly and cried several times too! 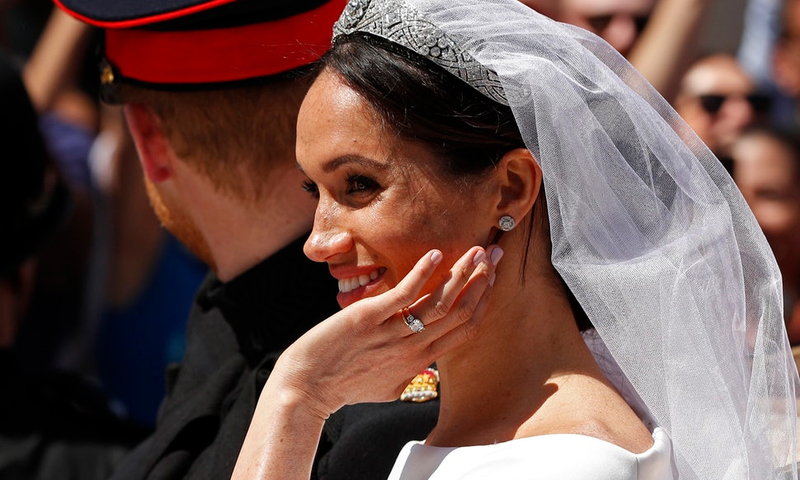 I hope the new Duke and Duchess of Sussex will be very happy together and I hope we will continue to see Meghan wear her new jewelry often! 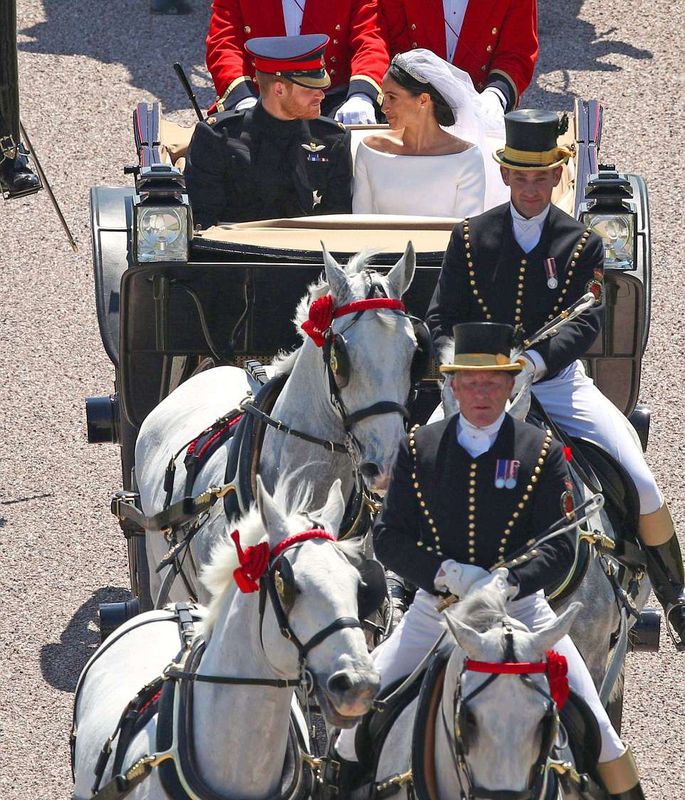 Crazy for this shot of them in the landau carriage! Love love love this photo of them. Let me know what you thought about any aspect of the wedding! Aquamarine not often featured here. Jewels very nice; her dress not what I expected but not awful either. Harry's attire rather drab. 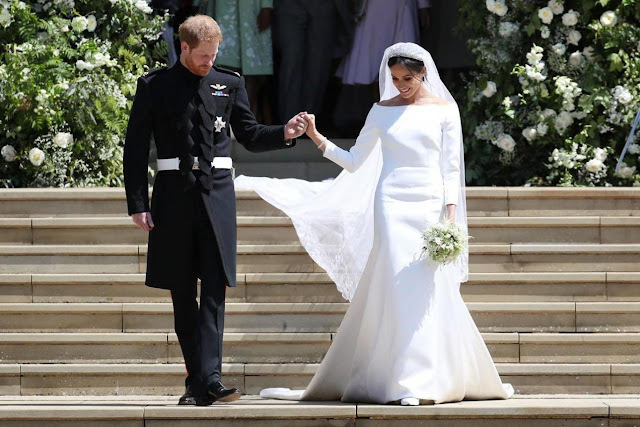 Since Meghan is a California girl I knew she would keep the wedding gown (and reception gown) classic, elegant and simple. She just knocked it out of the park. I am also not a fan of tiaras but her tiara was beyond perfect, kind of a headband - but the most beautiful expensive headband ever. 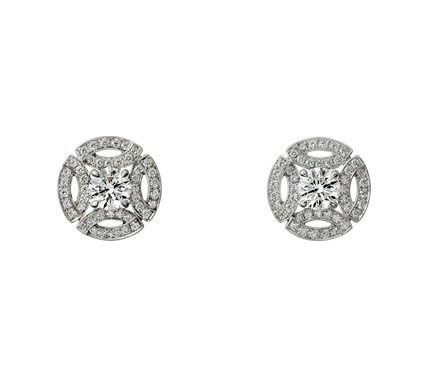 My favorite design in diamond jewelry is geometric & I am still swooning over her wedding jewelry. WOW. Harry's attire drab - I think not. 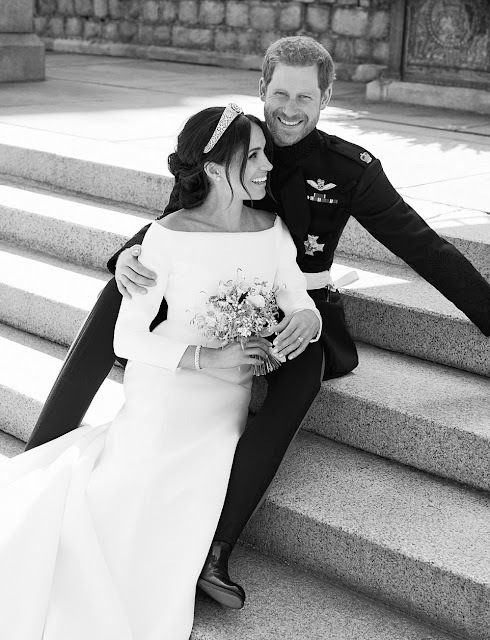 I loved the tiara and her simple gown...as far as the diamond bracelet goes....WOW! It would be such fun to wear a sparkler like that one...I might even sleep wearing it if it were mine...a gal can dream.